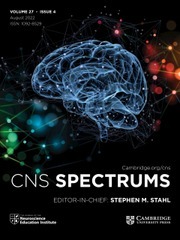 CNS Spectrums covers all aspects of the clinical neurosciences, neurotherapeutics, and neuropsychopharmacology, particularly those pertinent to the clinician and clinical investigator. The journal features focused, in-depth reviews, perspectives, and original research articles. New therapeutics of all types in psychiatry, mental health, and neurology are emphasized, especially first in man studies, proof of concept studies, and translational basic neuroscience studies. Subject coverage spans the full spectrum of neuropsychiatry, focusing on those crossing traditional boundaries between neurology and psychiatry.